8 globe strand works well with 15×15 and 20×20 canopy pole tents. 10 globe strand works well with 20×30 and 20×40 canopy pole tents. 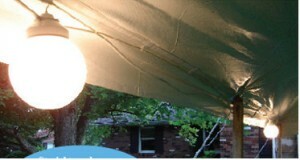 Tent lighting is a great way to extend your party past sunset. 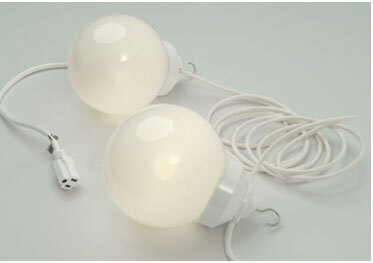 If your event will last into the late evening or night you will need to consider lighting to ensure your guest safety. The 8 globe and 10 globe light strands are perfect for canopy pole tents. Each globe holds a 60 watt light bulb and attaches to the side wall rope around the interior edge of the canopy pole tents. Our crews will install the lights on our tents, hook them up to an electrical outlet on your home (you may need an extension cord depending on how far the tent is from an outlet), and test them to make sure they are working properly. Your now ready to have your event last as long into the night as you want.